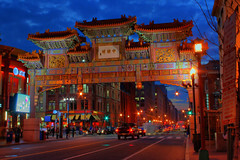 We’re excited that this Wednesday night at 6pm, Derrick Story, author of Pocket Guide to Digital Photography and proprietor of The Digital Story, and We Love DC will be putting on a Photowalk through Chinatown and Penn Quarter. We will gather at the Friendship Arch (pictured above) from 6:00 to 6:10, and we’ll probably walk about 90 minutes, before finishing at RFD at 7:30 or so for a round of tasty beverages on me. We’ve also got a feature slot lined up on Thursday morning to feature your night shots of Chinatown and Penn Quarter, so if you can get a rough cut of your shots from the evening posted to our Flickr Group before 8am on Thursday, that would be most excellent. Let us know if you’re coming, just put a comment in the thread, and we’ll keep an eye out for you Wednesday night. I’m definitely in. Putting it on my calendar right now! I’ll be there as well. Looking forward to it. You can count me in. I’ll bring a friend too. I will try to make it – might not be able to get out of work early enough. How cool! Will try to make it and may bring a friend too. I’d love to come! See you Wednesday! I’l be there, and I’ve been itching to give my new lens a workout. Daphne, you should totally feel free to come with your point-and-shoot. Conveniently located on my way home from work. I will try to be there. I’m in! Would love to learn how to snap photos of common destinations in a less common way. I’m planning to attend this. I’m excited about it! I’m new to shooting night shots so any help from you guys will be much appreciated!!! Daphne, as long as you love photography, equipment is just details. Trust me, I completed the better part of year’s project 365 with nothing but a point-and-shoot. I absolutely love my point and shoot, and I think mastering the P&S is a great challenge to every photog. Bring it out, Daphne, we’ll be psyched to see you. Thanks for the encouragement! I’ll definitely make it a point to come on Wednesday. For those of you planning to do night photography (or even twilight), make sure you bring either a tripod or even a monopod (Gorillapods are faboo AND compact to boot!) because you’ll need the stabilization. Sorry to miss out on this one; hopefully we can set up a WLDC holiday photowalk in December! I happened to bring my dslr with me to work today…hopefully parking isint too crappy. Hi, I will be coming and bringing two friends. Hope to try to make it on my way home from work. I rolled up to the group right as the introduction was wrapping up. Did somebody mention where to upload pics to? I put my best ones (the ones dated Nov 4th) on my flickr account for now. Add them to our flickr pool or just tag them with wldcphotowalk. Thanks Tom! I tagged them. Mine are up but I couldn’t add them to the pool as there’s a limit of 8, and I’d rather go to bed than figure out which five shouldn’t go into the pool.